After an off weekend for the whole squad in Tennessee, Rockstar Energy Racing was determined to improve in Michigan. They did what they set out to do, making forward progress with every rider in front of the craziest fans of the season at the Redbud Motocross National. The Buchanan, MI fans did not disappoint as expected, with their costumes and flags saluting our Country's birthday on the 4th of July weekend. There was red, white and blue everywhere and the team was able to celebrate with them via a podium finish by Jason Anderson. Jason Anderson's luck really turned around in the first moto at Redbud. The track was so rough and technical that it was an accomplishment in itself just to stay on two wheels. After not having an amazing start, one by one riders fell in front of him and he remained solid. By the end of moto 1, Jason found himself in 3rd place after 30 minutes plus 2 laps. In the second moto it was all Anderson's doing that put him where he needed to be for a podium finish. One thing that must be noted were his line choices. While in the past few weeks he has struggled with altering his lines to adapt to changing track conditions, that was not the case last weekend. Jason was being very creative and that certainly helped him attain the end result. While he started outside the top 5 once again, in moto 2 he fought hard. Moving forward through the pack while winning a mid race battle with 2014 multi moto winner Blake Bagget on the way. He caught up to Marvin Musquin but ran into some issues with lapped riders and ran out of time. Had he secured the pass on Musquin, he would have collected a 2nd place overall. He had to settle for 3rd. If this is a sign of things to come, he will return to the podium on a similarly surfaced Budds Creek next week. 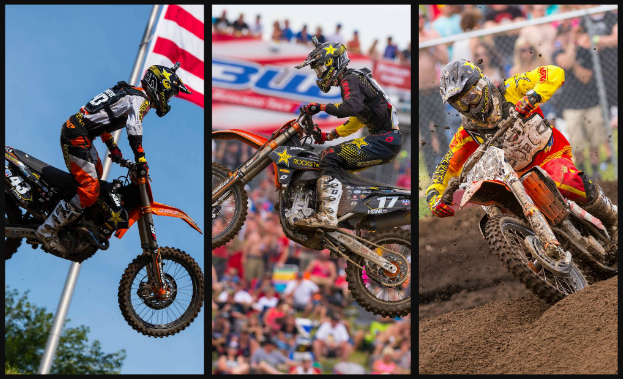 Jason Anderson: This weekend at Redbud went well. I had two solid motos and I'm stoked to leave Michigan after being on the box. I want to continue with this momentum and build on it." Joey Savatgy had a really tough first lap of moto 1. He went down once, then remounted only to have another rider fly out of control into the side of him, taking him down again. Luckily he was unharmed in the incidents and able to salvage a top 20 by the end. His second go around was much better and also marked his best outing of the year. He managed to pull a holeshot from the far outside and lead for a while. He held his own before succumbing to the pressure of the championship points leaders before eventually settling into tenth. His first top ten of the season and a solid moto without major mistakes and a holeshot, was without a doubt an improvement. Joey Savatgy: "The first moto I struggled. I fell on the first lap and then got cross jumped on and went down again. I ended up coming back to 19th. The second moto I got the holeshot which was really cool. I'm still not feeling completely comfortable and I fell back to 10th. Still it was a step in the right direction and at least I finished a moto in the top 10." Ryan Sipes is now officially filling in for the injured Davi Millsaps. Since the GNCC season doesn't reconvene until October, Sipes schedule was easily able to be cleared to jump on the bike and race nationals. The struggle at this first round with the team was bike setup. Ryan was literally testing suspension, motor mapping etc. in practice and the races at Redbud. His first moto aboard the Rockstar Energy Racing KTM was a difficult one. Having trouble with the rough track and going down several times. He was able to provide enough info however to the suspension technician to improve the bike drastically. The change showed in his result in the final moto as he just missed the top ten by one position. He came back with additional feedback as well to improve the motorcycle to his liking even more going into next week. Ryan Sipes: "Redbud was up and down a little bit. The first moto was not too good, I had a couple crashes. I really kind of struggled to get used to the new bike. We made a lot of changes before the second moto and it was a lot better. I got a decent start and ended up 11th. I really wanted 10th and I tried really hard for it but I made a little mistake towards the end and it kind of took me out of it. I'm really happy though with making progress throughout the day as far as the bike goes and I'm looking forward to next weekend." After moving past the halfway point of the series, the team will travel to Maryland next week and another rough track with many elevation changes in Budds Creek. Anderson who stepped his game up a couple notches will seek a 2nd consecutive podium. Savatgy will try to improve on his 10th place moto finish with a top ten overall. Sipes will have a much better chance for a top 10 himself with the bike being far better suited to him coming into the race. He will be on the bike until the last 3 rounds, when Millsaps is scheduled to return. If Davi cannot, Ryan will stay racing with the team.